Art lovers in the North are not sophisticated enough to appreciate a new exhibition due to open on Tyneside, it is claimed. Controversial London-based art critic Brian Sewell says the exhibition, by a group of post-war artists, should be on display in the capital. Mr Sewell, who criticised the Gateshead Angel when it was erected, said London was the "centre of the art world in Britain". But Paul Collard, chairman of Northern Arts and a member of the Arts Council, said northern audiences were just as sophisticated as those in London. Mr Sewell said he was "very upset" to learn the exhibition of post-war art - called Cobra - was to go on show at the Baltic Centre for Contemporary Art in Gateshead and not in London. "London has for centuries been the centre of the art world in Britain," he said. "By the very nature of the audience in London it is exposed to very much more art and culture and is therefore more sophisticated. There is no doubt about it." Mr Collard said: "I don't accept that. Investment in cultural facilities in the regions has stimulated an extraordinary renaissance in regional capitals like Newcastle. "I think the audiences are growing extremely sophisticated outside London and are getting the chance to be exposed to a wide cross-section of art." The touring exhibition, ironically arranged by the Hayward Gallery in London, will be on show in Gateshead for six weeks, starting in March. Cobra, which was founded in November 1948 and survived until November 1951, is considered the last great avant-garde movement of the century. The name is made up of the first letters of the cities where its members lived and worked - Copenhagen, Brussels and Amsterdam. Mr Sewell added: "It is absolutely absurd to arrange a major exhibition of fundamental importance to the understanding of what happened to art in the second half of the 20th Century and deprive London of an immediate view." But Mr Collard said: "Major exhibitions are now going to start taking place outside the capital and people in London are going to have to travel." The �46m Baltic centre, perched on the banks of the River Tyne, opened in July 2002. More than 5,000 art enthusiasts queued for the opening of the gallery, dubbed the "Tate Modern of the north", which is housed in an old flour mill. 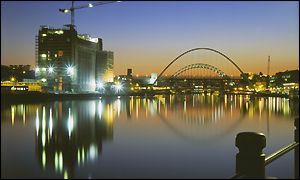 It is also one of the centrepieces of the the joint Newcastle/Gateshead bid to become European Capital of Culture in 2008. "Of course people in London are more sophisticated"
Are London art-lovers more sophisticated?